There are many ways to save money on your wedding, but smart spending—-knowing where the money is coming from, finding ways to use it wisely, and earning even more money from it before it’s spent-—tops the list of strategies. These are key to keeping your spending under control and making sure what you owe does not exceed what you can pay. 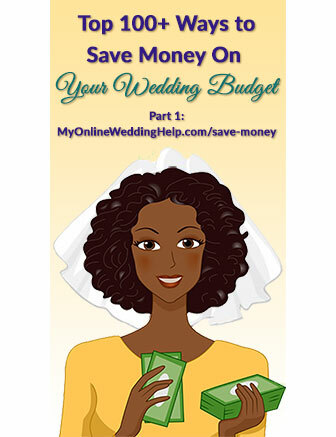 Here in part one I cover money management as well as the venue and planner, caterer, and the toast. Part two has ideas about drinks, cake and dessert, flowers, centerpieces, photo and video, beauty items, and live entertainment, and part three addresses the rehearsal dinner, rings, skin care, dress and accessories, save the dates, jewelry, the reception, and gifts. 1. Ask those who are helping to pay for the wedding if they are able to give you the money ahead of time instead of paying for a service. Then put that gift, as well as money you are contributing to your wedding, into an interest-bearing savings or money-market account until you need it. 2. Begin planning by making a list of expenses (make use of this wedding planning check list). 3. Use a designated credit card for all purchases then pay off the entire balance when it’s due, to avoid interest fees. Note: As with most links on MyOnlineWeddingHelp.com, some of the links in this post go to this site’s shop section or directly to another website. My Online Wedding Help will receive a small commission from the merchant if you click and buy or sign up for a product. 4. Make sure the credit card is a cash back card, like Discover, that gives you money for every purchase you make. Learn more about how the Discover Card compares to others at MyOnlineWeddingHelp.com/Discover. 6. Choose a registry with the most free products and added perks (see the best ones in Get More From Your Wedding Registry). 7. If a vendor’s published packages are not right for you, go “off the menu” to reduce the cost and get only the items and services you need. 8. Understand lower cost is not always better. It’s about making the choices that meet your needs at the best cost. 9. Give potential planners a chance to make their case on how they can save you money. There can be added value in an individual’s connections and experience. 10. Confirm and get all agreements in writing to avoid last-minute surprises. 11. In evaluating costs of different venues, make sure you are comparing “apples to apples.” The words “all inclusive” can mean different things depending on the location, for example. 12. Ask potential venues: Is there an added charge for using my own vendors? 13. Ask potential venues: Does the price include alcohol, or is that extra? 14. Ask potential venues: Can I bring in my own food, drink, and/or cake? 15. Ask potential venues: If I do bring my own food, drink, or cake, are there extra charges? 16. Ask potential venues: Are rentals included in this price? 17. Ask potential venues: Are there set-up fees? 18. Ask potential venues: Is parking extra? 19. Ask potential venues: If there is an additional service charge does it cover all tips? 20. Ask potential venues: What are the additional taxes and related fees? 21. Ask potential venues: Is there an added cost for my other vendors, such as the photographer, videographer, planner, caterer, and DJ or band? 22. Ask potential venues: Are there special considerations for children (such as reduced meal cost)? 23. Consider having your wedding in a lower-cost town or state (check out your state’s relative wedding cost in Relocate your Wedding and Save). Rural and suburban locations are often more affordable than large metropolitan areas. 24. Have detailed conversations about what is (and is not) included in your wedding package price and any additional fees that may apply. 25. Be sure you know exactly how the caterer determines final cost. 26. Discuss buffet as compared to served, sit-down meal costs. Buffet is not always cheaper. 27. Allow enough money for the chef’s specialty or other higher-end items by choosing the lowest cost items for other courses. 28. Save money by offering fewer food courses. 29. Limit the number of mealtime protein options you offer guests. This can mean it’s easier and more economical for the caterer, who in turn can charge you less. 30. Serve filling food that is minimally processed and has a lot of fiber. Each guest will eat less. 31. Serve in-season fruits, vegetables, and meats. They cost less than out-of-season fare. 32. Consider an ethnic menu rather than American. Some choices—chow mein, mousaka, pizza, or a taco bar for example—can be both economical and more interesting than traditional wedding fare. 33. Serve pre-meal appetizers to help fill your guests up before the featured food, allowing you to decrease the entree’s serving size or go with a more premium selection. 34. Serve a pasta entree to more economically satisfy guests’ appetites. 35. Make the toast beverage a sparkling wine instead of Champagne (the only difference, besides price, is the grapes in Champagne must be grown in Champagne, France). 36. Pass out flutes with a token amount of bubbly for the toast and make more available only to those who will actually drink it. 37. Let the guests choose whether to use their own drinks or the champagne for the toast by having servers pass around glasses to those who want it. 38. If you want to shake and spray the bubbly in celebration, go straight to the lowest-priced fizz for those bottles. Next up: Part 2 has cost saving ideas about drinks, cake and dessert, flowers, centerpieces, photo and video, beauty items, and live entertainment. This is a great post! I’m going on to the second one … good job Bobette! Just a small note champagne and sparkling wine are the exact same thing. The French just try and have this role that it can’t be called champagne unless its from the Champagne region. Its just easier to call it champagne so people know what youre referring to. Thanks Alanna. You are correct about technical definition of champagne, which is exactly what I was getting at … buy fizzy wines made outside the Champagne region and you can find them a lot cheaper.